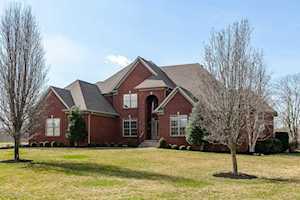 The Hollinden Team updates this search for Harrods Crossing homes on a daily basis from the Louisville MLS. Feel free to use the Advance Search Tools of our Louisville MLS to find other houses for sale in Oldham County. Click the map to the left to view each home for sale in Harrods Crossing. There is a satellite view button in upper right. Brick is the most common construction type in Harrods Crossing. However, you will see that some homes in the subdivision have lovely stone accents on the outside. Harrods Crossing features custom built homes so each home had its own style and charm. Styles of homes in Harrods Crossing are two-stories and ranches. Harrods Crossing homes boast large lots. Typically the lots are between two to three acres each! A few of the homes in Harrods Crossing have in-ground swimming pools as well. Overall, the outdoor area of Harrods Crossing homes is beautiful. The garages are large too, featuring three to four car garages per home. Inside Harrods Crossing homes, you’ll find three to five bedrooms and four to six full bathrooms. First-floor master bedrooms are in just about every home in Harrods Crossing. Harrods Crossing houses are very spacious. On average, these homes have 3,000 to 7,000 above grade square feet! Each home has a basement as well, and many are walkout basements. Expect only the finest upgrades in Harrods Crossing homes. Stainless steel appliances, Brazilian cherry floors, Amish cabinetry, and granite countertops are some of the features you’ll find in these homes. Harrods Crossing is very convenient shopping and expressways. I-71 is only five minutes away from Harrods Crossing. Downtown Louisville is only 25 minutes away. For grocery shopping, there is a Kroger and Walmart a few miles away from Harrods Crossing. The closest shopping malls can be found in Louisville. The Paddock Shops is about ten minutes away from Harrods Crossing and is probably the closest shopping center. Also, Downtown La Grange has a few places to shop. Antique shops, consignment shops, and bridal stores are a few types of stores you’ll find in Downtown La Grange. There are also a number of restaurants in Crestwood to try. A few of the restaurants in Crestwood are Red Pepper Deli, Gustavo’s Mexican Grill, Rikishi, Texican’s Barbeque Pit, and A Taste of Thai. Harrods Crossing is in the Oldham County School District. The following schools are the home schools for Harmony Crossing: Harmony Elementary, North Oldham Middle School, and North Oldham High School. Harmony Elementary and North Oldham High School are two of the four schools of distinction in the Oldham County School District. North Oldham Middle School is one of the four highest performing schools in the district. If you would like to learn more or have any questions about any of these Harrods Crossing houses for sale, or others in the zip code 40014, just click the "Request More Information" button on any property detail page. The Hollinden Team can provide you with past sale information, comparables, disclosures, PVA assessment, and tax information – we would love to answer any real estate questions you have.